Recently significant advances have been developed in nano-carbon materials (nanotubes, graphene, nanodiamonds, fullerenes, nanoporous), not only in terms of fundamental/basic studies but also in technological applications. Following the steady growth and maturity of the field of nano-carbon research, which now includes a significant industrial input, it becomes essential for sub-groups or communities to be organized around particular scientific challenges. Under this context, the inclusion of dopants and/or surface modification to these pure carbon materials opens the possibility of tuning their properties (electronic, optoelectronic) and in some cases in a controlled way. In addition, other layered inorganic materials, in particular boron nitride, WS2, MoS2 will be also covered. The activity of this research field is very high and involves multidisciplinary areas as chemistry, physics, materials science, and other prominent ones as biology and medicine due to the functional aspects of these nanomaterials. Thus, the impact of these researches covers a significant number of potential applications as improved (bio)sensors, interconnectors (electronic), optoelectronic devices. This conference will provide a forum for researchers, scientists, and engineers from different countries worldwide who are actively involved in the research on issues to disseminate their latest research results and development achievements. In addition to the exciting scientific and technological themes, the conference offers a platform to promote and encourage interaction among researchers for collaboration. The program will consist of a combination of invited, contributed oral, and poster presentations. 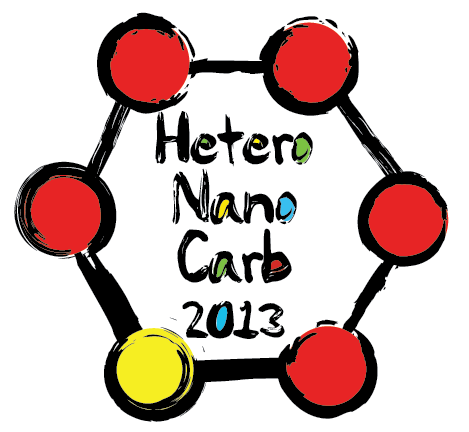 You can download a PDF of the programme here: HeteroNanoCarb 2013 Programme. Laboratorio de Microscopias Avanzadas (LMA), Instituto de Nanociencia de Aragona (INA) - U. de Zaragoza, Spain. One page abstracts that include specific results and conclusions to allow a scientific assessment of proposed oral presentation or poster are invited. Abstracts should be submitted electronically at https://ssl.linklings.net/conferences/HeteroNanoCarb/. Editing the abstracts is possible after submission until the submission deadline. Castelldefels is a suburb of Barcelona, about 15 km from the Barcelona International Airport. It is best known as a beach community that is nestled between two distinct ecosystems: the Llobregat River delta and reed beds and the limestone highlands of the Garraf Park. The beach itself is almost 5 km long with an average width of 90 meters, which make it popular for swimming, sunbathing and walking along both the beach and the promenade. The City Council has installed free wifi service on the beach. A point of interest in Castelldefels is the castle. In the 10th century, Castelldefels was on the frontier with the Arab Caliphate of Cordoba. It was in this era that Count Sunyer commissioned the Monastery of Sant Cugat to set up what would ultimately become Castelldefels. Under the direction of the monastery, work began on the construction of the Church of Santa Maria. The first documentary records available date from the year 967. The castle sits atop a hill, dominating the coastal strip between the Garraf Massif and Barcelona. The southern half of the castle houses the chapel, originally Romanesque in design, with one single nave and transept and the associated facilities: the rectory, the sacristy, the cemetery and the courtyard. A range of walking paths lead slowly up to the castle and the castle park, with different routes through the abundant flora, including such exotic species as Mediterranean fan palms. The summit of the hill is the best point from which to look out over the Garraf Massif, the Collserola Uplands, the Plain of Barcelona, Montjuic, the Llobregat Delta and the coastline. The Castelldefels City Council bought the castle in 1988. A historical and archaeological study of the site began in 1989 and plans were drawn up to restore and refurbish the church. The project involved the reconstruction of the damaged areas and the repainting of a number of structures: the white of the Romanesque building and the blue of the Capella de la Salut or Our Lady of Good Health Chapel. Inside, the presbytery was adapted in order to allow the ancient Iberian and Roman remains in the subsoil to be viewed. The Capella de la Salut was also refurbished, preserving both the neoclassical paintings and the graffiti dating from the Spanish Civil War (1936-1939). In the hills just outside Castelldefels, the hotel is a 25 minute drive from central Barcelona. It is on a hill surrounded by pine trees and offers a superb conference center, an art gallery, a large terrace with great views of the sea as well as both indoor and outdoor pools. It also has a gym, sauna, racquetball court and ping-pong table. The rooms are decorated in classic style and have air conditioning, a minibar, free Wi-Fi and satellite TV. Bar snacks are available on the terrace. There is ample free parking on site. A golf course is near by. Children under ten years are free is using existing bedding. Leave the airport and follow the signs for C-31 highway (heading toward Sitges). The average fare is 20 euros. Take the C-1 heading to El Prat de Llobregat, where you should change to line C-2 heading toward Sitges/Vilanova/Sant Vicenç de Calders. Engineering Conferences International (ECI) is a not-for-profit global engineering conferences program, originally established in 1962, that provides opportunities for the exploration of problems and issues of concern to engineers and scientists from many disciplines. The format of the conference provides morning and late afternoon or evening sessions in which major presentations are made. Poster sessions will be scheduled for discussion as well. Available time is included during the afternoons for ad hoc meetings, informal discussions, and/or recreation. This format is designed to enhance rapport among participants and promote dialogue on the development of the meeting. We believe the conferences have been instrumental in generating ideas and disseminating information to a greater extent than is possible through more conventional forums. All participants are expected both to attend the entire conference and to contribute actively to the discussions. The recording of lectures and presentations is forbidden. As ECI conferences take place in an informal atmosphere, casual clothing is the usual attire. Nature Publishing Group is sponsoring a Prize for the best Poster presentation. Most non-European citizens entering Spain must bring a valid passport. For European nationals a valid identity card suffices. Most foreign participants must also acquire an entry visa from the diplomatic mission that represents Spain in their home country. Plan well ahead of time, since issuing an entry visa may take weeks. In general, the applicant must apply in person. More information can be found at the Ministry for Foreign Affairs website. Only Euro is acceptable as currency at stores and restaurants. You can exchange money at the airport or a bank. Automated Teller Machines (ATMs) are plentiful. Participants are advised to take care of their own personal insurance. HeteroNanoCarb-2013 organizers will carry no responsibility in case of an accident, sickness, theft or other property damage. The Spanish time zone during the summer is GMT+2:00. Spain operates on 220 Volts, 50 Hz AC for electrical appliances. Registration is handled by Engineering Conferences International. Please use the button below to launch the registration form (opens new window). Attendance will be limited to 120 participants. © HeteroNanoCarb 2013. Website by Customised Web.